Mikey McKennedy, co-owner of pizza shop Sizzle Pie, is used to doing business in rough neighborhoods. He had a bar in Portland’s Old Town for eight years and runs two Sizzle Pie restaurants on Burnside Street in Portland. So he didn’t think opening his first restaurant outside of Portland — across from Kesey Square at the intersection of Broadway and Willamette Street in downtown Eugene — would be such a struggle. The increasingly blunt complaints from people visiting and working downtown come at a time when many say the area may finally be at a turning point after years of work — and millions of dollars of private and public money — have been invested in efforts to renew and revitalize downtown Eugene. A turf war is being waged in the square, especially in warmer weather when more people flock to it. The tension is palpable between the street people who hang out in the square and the commercial district springing to life around them. Because it is designated as public space, not a park, Kesey Square is not subject to the more restrictive park rules, such as closing at night. In a plea for help, McKennedy in October fired off an email to city leaders detailing his concerns — brazen drug dealing, harassment of customers and employees and escalating violence — “actual knife fights in front of our restaurant.” His concerns were soon echoed by others who have invested in the Kesey Square area and who said they fear for the safety of their employees and customers. A flurry of emails and numerous meetings followed but no action, leaving McKennedy extremely frustrated, he said, and worried about the future of downtown. “I just don’t see downtown Eugene changing until something is done about the heavily entrenched homeless and menacing drug addict population,” McKennedy wrote in his email, which The Register-Guard obtained, along with other correspondence, through a public records request. The Eugene Police Department is doing all it can, given its budget constraints, McKennedy and other business people said. With 767 calls for service through October this year, Kesey Square is a crime hot spot, according to the department. A total of nine bicycle officers patrol the downtown area, up from two in early 2011. Downtown Eugene Inc.’s downtown guides, known as “red caps,” also patrol the area, and CAHOOTS, White Bird Clinic’s mobile crisis intervention team, responds to calls for help dealing with people experiencing mental illness or substance abuse crises. Mayor Kitty Piercy “is responsive, but she seems not to have a lot of power,” McKennedy said. He said he thought that, coming to a smaller town, it would be easier to raise issues and work together to quickly find solutions but that hasn’t been the case. Councilor George Brown, whose ward covers the Broadway-­Willamette street area, said he hasn’t been contacted directly about those concerns by Mc­Kennedy or other downtown business owners. Brown is co-founder and owner of the Kiva, a downtown natural foods store, so he said he understands and sympathizes with McKennedy’s concerns. Such a court could require offenders to do community service, make restitution or undergo drug or mental health treatment rather than pay a fine or serve jail time — the current penalties often meted out. Council President George Poling said that following the council’s recent decision to let the downtown safety zone lapse at the end of November, he had planned to ask Eugene Police Chief Pete Kerns for a recap of downtown activity in about three to six months. The downtown safety zone had allowed officers to exclude repeat offenders from that area. But the range of crimes that triggered exclusion had become so narrow that few criminals were excluded, said Sgt. Larry Crompton, who leads the downtown police team. The downtown exclusion zone has been “rendered useless since last October,” Crompton said. Anyone who likes the changes they have seen downtown recently should feel a sense of urgency, McKennedy and other downtown business people said, because the criminal and intimidating behavior of some of the people in Kesey Square threatens to slow the revitalization that is underway. Successful businesses can help steer more businesses to an area. But McKennedy said he can no longer in good conscience highly recommend this part of Eugene to other businesses that are scouting sites. And Sarah Bennett, president of the board of nonprofit business group Downtown Eugene Inc., said potential tenants have been driven away by what they’ve seen in Kesey Square. “There were retail entities that were looking at locating in the core that specifically chose not to because they came down on a day when groups were gathering and there was bad behavior,” she said. Business owners and managers near the square say it’s tough trying to welcome customers — including some who haven’t ventured downtown in years — to their shops and restaurants while dealing with the lingering effects of the failed downtown pedestrian mall. Jackhammers did away with the pedestrian mall and reopened the section of downtown to vehicles more than a decade ago. But workers and customers only started flocking back recently, after millions of dollars in public and private improvements. That community investment needs to be protected, business owners said. It’s a difficult position to be in, these business people say, putting out a plea for help without setting off more alarm bells that might cause customers and new businesses to avoid the area. “It’s hard for us to talk frankly about it because we don’t want to discourage people from coming down here,” said Brian Hebb, co-owner of the Cowfish dance club on West Broadway and general manager of Sizzle Pie. He and other business owners are quick to add that, even with the problems, conditions in the area have improved from even a year ago. Stuart Phillips, co-owner of Red Wagon Creamery, said, “We have seen up and down Broadway that there has been a real reduction in the panhandling, and the loiterers have tended to move down by the bars, and they’re not as omnipresent as they once were,” he said. “The police have been very responsive,” Phillips said. “The bike patrol comes around several times a day to check on things. Any time there’s any sort of an issue we see them responding quickly. A month ago there was a fight in the alley across the street. The police were there quickly with three or four cars. It was heartening they weren’t just sending one person down to try to herd cats. The extent of the problems businesses encounter appear to vary by type of business, their proximity to Kesey Square, and how late they’re open. Clare Bennett, manager of the Townshend’s Tea shop at 41 W. Broadway, said the shop hasn’t encountered much trouble. “There is kind of a rough element down here, but I think it’s anything a vibrant downtown has to deal with,” she said. “It used to be that people might have felt afraid to come downtown, but now that we have more of a critical mass of normal paying customers walking around, I don’t think it’s as much of an issue,” Bennett said. “We do have some awkwardness sometimes when someone will come in who [has a mental illness] and take over our couches and we have to ask them to leave, but I wouldn’t say it’s a major issue,” she said. “My main concern is to make sure that our customers can get here easily and they don’t feel hassled or panhandled to the point where they don’t want to come here,” she said. 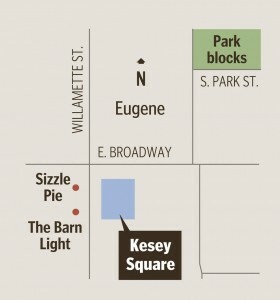 At the southwest corner of Broadway and Willamette St., Sizzle Pie has had a ringside seat to activity in Kesey Square. Employees at Sizzle Pie, which is open from 11 a.m. to 3 or 4 a.m. since it opened its doors in April, said they have seen it all — from the bizarre to the brazenly criminal. “In the last two weeks we’ve had three incidents involving weapons. Literally, there have been actual knife fights in front of our restaurant that our employees have had to contend with. In addition, we had an intruder enter the premises, pick up a barstool and hit 2 patrons with it. Only one of these situations involved an assailant who was our patron, and for the record, we had not served him alcohol. After a meeting with McKennedy on Oct. 8, Piercy emailed the officials again, reiterating her pitch for a direct police contact for these businesses. “With new residents downtown, this safety issue is going to become even more serious,” she wrote. Email records show that Piercy had expressed concerns about behavior in the Broadway-­Willamette street area even before McKennedy sent his email. Correspondence to city officials from several other downtown business people followed, including an Oct. 15 email from Caroline Cummings, vice president of business development at Palo Alto Software, which moved into the renovated Broadway Commerce Center earlier this year. She said that in her one-block walk to work at the Broadway Commerce Center she is verbally accosted at least three times a week by men in their 20s or 30s, who make sexually explicit comments. “I’ve lived in Philadelphia for 14 years and I have to say, I felt safer there than I do now in Eugene,” Cummings wrote. She wrote that she and her colleagues can’t even sit in Kesey Square and enjoy lunch because of the amount of negative activity there. She also recounted an incident that occurred at 11 a.m. on a recent weekend when she took her 82-year-old mother-in-law to Townshend’s teahouse. A day after Cummings sent her email, Palo Alto CEO Sabrina Parsons emailed city officials stating that one of her biggest concerns is the safety of her 48 employees, and that she worries about employees safely walking from work to the parking garage. Josh Cochrane, Palo Alto’s vice president of product development, emailed Parsons, copying the message to city officials, saying that “given what the city has achieved so far … I’m frankly just baffled that there seems to be little focus on ensuring that our revitalized downtown is a safe, clean environment where everyone in town can feel comfortable. “This strikes me as a huge and potentially fatal competitive disadvantage for downtown as a place for thriving businesses,” he wrote. “If I go shopping at Valley River, I don’t have to navigate around sleeping people or watch drug deals go down in the doorways of open businesses. If I have lunch at the courtyard over at Oakway Center, I’m confident I’ll be able to eat my food in a comfortable, peaceful environment. No one will ask me for money. I won’t be interrupted by shouting arguments or the hollering of crazy people. Sgt. Crompton recently took a Register-Guard reporter on a walk-along in the early evening from the downtown police substation at the new Lane Community College building on Olive Street down West Broadway to Kesey Square. He pointed out a succession of new businesses: First National Taphouse, Red Wagon Creamery, Townshend’s Teahouse, the Bijou Metro movie theater, Soubise restaurant, Sizzle Pie and The Barn Light. “We’ve got everything down here now, and this is all within a year,” he said. “If you came down here a year ago it was a cesspool,” Crompton said. “It was a mess. It’s great what this has become. I give credit to the guys (officers) on bikes, DEI (Downtown Eugene Inc.), the businesses and the community. It was definitely a community effort, and we’re not there yet. “A year from now it’s going to be better than it is now,” he said. Having said that, Crompton looked across Willamette Street to the bench that is part of the statue of Kesey reading to children. “Would you feel comfortable sitting on that bench?” he asked. Kesey Square and the “wavy wall” — a slightly curvy concrete bench across East Broadway — are known as places where people go if they want to buy drugs, Crompton said. A cluster of seven people, from 20-somethings checking their cellphones to an older man with a graying beard, were sitting on or in front of the bench, not interacting much with each other, just sitting, staring, waiting. On the wavy wall directly in front of the building at 1 E. Broadway, another group of young people clustered. A young woman sitting on the wall broke into an eerie, haunting melody accompanying herself on the accordion. Crompton, who has led the downtown police team for the past year and a half, said he talked with a retired Portland police lieutenant who said there are three types of people who make up “the homeless”: the have-nots, the cannots and the will-nots. The have-nots are people who are willing to work but who can’t make enough to support themselves. The cannots are people who are physically or mentally disabled who don’t have the ability to get a job, he said. And the will-nots are able-bodied people refusing to work, taking advantage of social services, which Eugene has a lot of, Crompton said. Of the people hanging out in the Kesey Square area, 90 percent are the will-nots, he said. “They’re angry, aggressive and in-your-face,” Crompton said. Most are male, age 16 to 25 and are involved in the sale or use of drugs, he said. “A lot will claim they’re from Eugene, but they’re from somewhere else,” Crompton said. Eugene is a popular spot for “travelers,” especially in the summer as they pass through on their way to music concerts or other events. “Eugene is known for good drugs — good marijuana with high THC, and good concerts,” Crompton said. Community activist Alley Valkyrie said travelers come to Eugene for the Oregon Country Fair, the Fairieworlds Festival and the Kaleidoscope music festival. She said that this summer she asked some young travelers why they were in Eugene and they said they came to sell drugs at Kaleidoscope. “If we don’t want that population, stop holding big counterculture events that attract people from around the country,” she said. 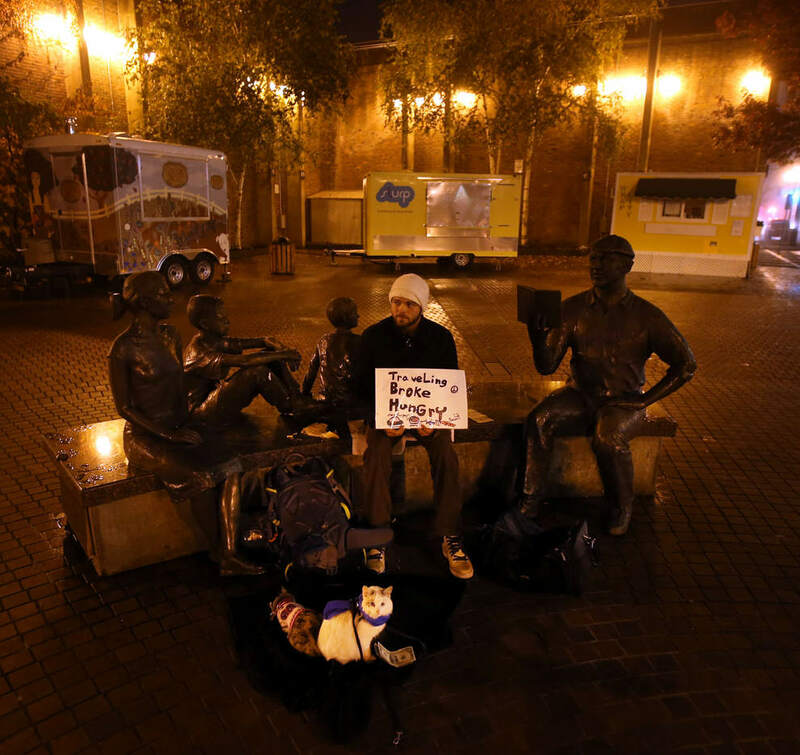 Travelers and other homeless people end up in Kesey Square because “it’s the only place to go,” Valkyrie said. “The (downtown) park blocks and Kesey Square are pretty much the only places you can sit and be without having to participate in commerce,” she said. Those who get caught smoking pot in the Park Blocks and are excluded under park rules end up at Kesey Square, Valkyrie said. Because Kesey Square is designated by the city as a public space not a park, it is not subject to the more restrictive park rules, Crompton said. The area’s designation as public space dates back at least to the early 1970s when the downtown pedestrian mall was built, said Laura Hammond, spokeswoman for the city’s planning and development department. In 1971, Eugene’s Urban Renewal Agency officially transferred ownership of the site to the city. The site was “forever dedicated to the use of the public,” according to the deed. 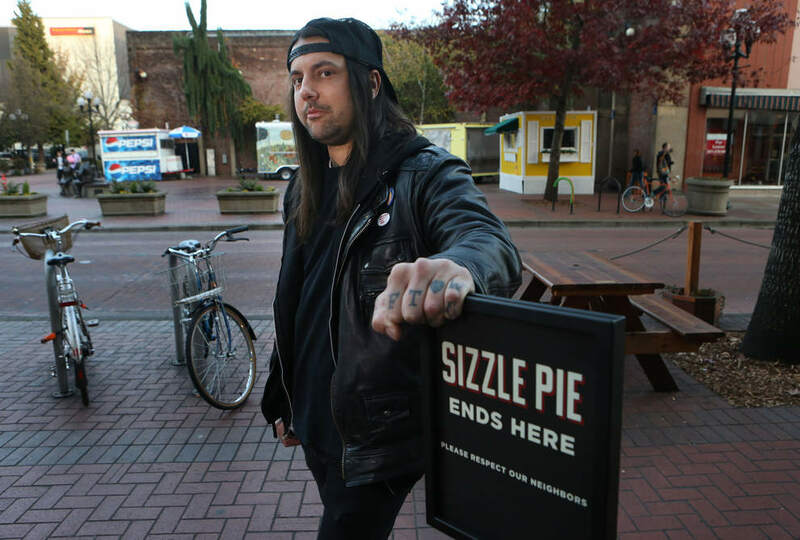 Sizzle Pie’s Mc­Kennedy said some of the resistance he has heard to his plea to improve conditions at Kesey Square is that people want it to remain public space. “That’s fine,” he said. “But in Portland parks you don’t see 30 homeless kids gathered; you don’t see 15 kids sitting on a sidewalk outside (our) restaurant because the laws protect businesses and citizens. Something has happened in Eugene where people have confused civil liberties with the freedoms of 19-year-old methheads to harass people. “I can’t believe Eugene is having this intellectual discussion about civil liberties when they’re selling drugs right there,?? McKennedy said.